Antonia Smith, Holly Pond High School Athlete of the Month, with Gage Brewer, Encore Rehabilitation Athletic Trainer and Volleyball Coach Emily Brown. Congratulations to Antonia Smith, Athlete of the Month for Holly Pond High School and Encore Rehabilitation – Cullman! Encore Rehabilitation is proud of you too, Antonia! We wish you the best! Congratulations to all of the athletes that received Alabama Elite Preview Invitations these past couple of weeks. The “AEP” will begin on March 5, 2016. It is a preview of 80 of the best high school basketball (2017, 2018, 2019) players in Alabama. Here are the athletes who were invited that are affiliated with Encore Rehabilitation (through our Sports Medicine program in their school). Cullman Clinic Athlete of the Month, Austin Smith. Congratulations to the Cullman Encore Athlete of the Month, Austin Smith! 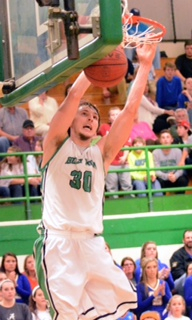 Austin is a senior at Holly Pond high school and a member of the Bronco’s basketball team, who is currently ranked #1 in the state for class 3A. He is averaging 21 points, 8 rebounds, 4 steals, and 2 blocks per game. (He can also make dunking look really easy.) After graduation, Austin plans on attending Wallace State Community College and majoring in Accounting. His parents are Brian Smith and Leslie Osborn. Good luck Austin, keep up the good work!